Day 0: The birthday that wasn’t so great. Day 0. Transplantation day; what a bittersweet day it is. I’m writing this update only because I’ve been given some strong medications to keep my nausea, body aches, head aches, and fever at bay. Over the past few days, I’ve developed what is known as ATG serum sickness. Basically what this means is that my body, since it has been primed to ATG from the last attempt at transplant, is freaking the eff out and having a complete systemic reaction to the flooding of a massive amount of ATG into my system. Because of this, I’ve been nauseous, febrile, achy, tired, dizzy, you name it! We’ve been juggling and balancing between many different kinds of drugs — some that ease nausea, some for pain, others for more intense pain — to keep the symptoms like fever, sore jaw, headaches, etc, in check. The serum sickness will eventually go away, but until then my care team is working with me around the clock to alleviate any pain and nausea I have. Today’s the day! Not going to write much more because I’m super tired, but I’m getting two bags of PBSCs totaling about 3.6×10^6 cells/kg of my weight. 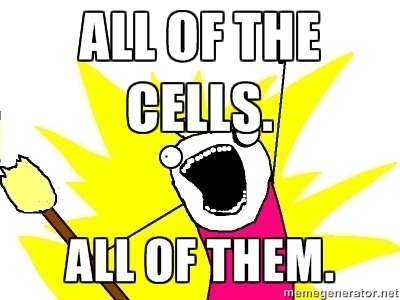 The average range is between 2 – 5×10^6 cells/kg, with 5 being the more optimal number of cells. There’s no direct correlation between engraftment success and number of cells above a certain threshold, which thankfully we’re above. My recovery time might be a bit longer, but we’ll just have to see. More updates to come as I feel better. Day -2: Say Hello to Steve. Day -2. I’ve successfully completed all three doses of rabbit ATG (with, thankfully, no further complications! ), all four doses of fludarabine, and I’m currently running through my last dose of cyclophosphamide (plus mesna because all the peeing). I must say I’m very, very relieved that the past two days went much better than the first day. I was worried that I might have more adverse reactions towards the ATG and so mentally prepared myself to brace the worst that could come, but I tolerated everything really well! No headaches even! 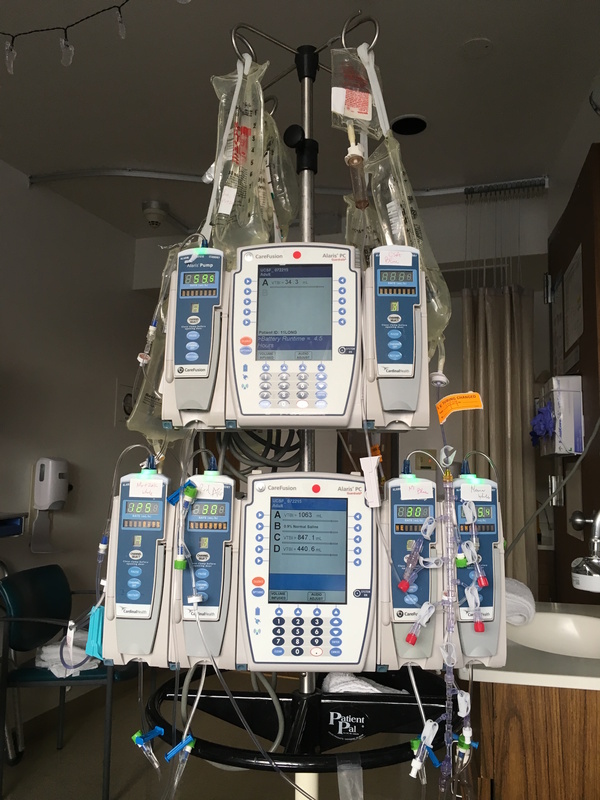 Through the combined experience and genius of all the doctors, NPs, nurses, and pharmacists on my care team, the choices to slow the ATG infusion and schedule/bum up the amount of medications worked great. Now onto the next hurdle, total body irradiation. I haven’t been told when the radiation is supposed to be happening tomorrow, but I do know it shouldn’t take more than 30-45 minutes and should leave no marks and cause no side effects. After all, as I explained in a previous post I’ll only be getting 2 Grays of radiation spread throughout my body. This is purely to serve as another means of immunosuppression not immunoablation (I’m pretty sure I just made that word up). Fingers crossed for the best to come! Last thing before I attempt to retire for the night as I’m still wrapping up the cyclophosphamide in the next hour and will get two units of RBCs since my hemoglobin dropped quickly over the past two days, I would like to formally introduce you to Adam‘s more experienced, beefed up, double deckered, older brother, Steve. He’s been using six units to continuously pump liters and liters of fluid into me like it’s nobody’s business (TWHS), and I’ve been urinating it all out, constantly. But that’s something I got used to with the last transplant. Anyway, welcome: Steve. Day -3: Shake it like a Polaroid picture. Day -3. The past few days have been quite challenging, hence why I haven’t posted anything since being admitted to the hospital for my second transplant. Right now, I’m sitting in bed getting my second of three doses of rabbit ATG, and later tonight around 10PM, I’ll be getting my third of four doses of fludarabine and first of two doses of cyclophosphamide (plus mesna to prevent bladder damage, which if you recall = tons of peeing, all the time). Yesterday and all of this morning were hard. During and after my first dose of rabbit ATG, I had really, really bad rigor (basically body shakes similar to if you were plunged into an ice bath, teeth chattering and all) and I kept spiking fevers with painful headaches and body aches. All night long I was toggling back and forth between being too “cold” (even though I was feverish) and being too hot. Rigor is a common side effect of ATG chemo, which I knew would be a possibility. Since I didn’t react poorly to it last time I was in the hospital, it seemed like I wouldn’t have a bad reaction to it this time — turns out that’s not true. To help calm the shaking down, I kept getting and am continuing to get doses of demerol which works like magic and stops the rigor pretty quickly. My doctor thinks the reason why I’m reacting so sensitively to the ATG this time is because my immune system is basically “primed” to responding to the ATG. There are memory B cells and T cells that, when challenged with ATG, have been upregulated and induce a massive cytokine storm which is what’s causing the fevers, achiness, and rigor. Moving forward today and tomorrow, my care team has decided to drastically up the ante on medications and significantly slow down the rate of ATG infusion. So far today, I’ve been doing much better than yesterday. I’m getting loads of steroids. opiates, and antihistamines on a schedule to hopefully reduce the discomfort of the whole chemo process. I’m hoping that because the chemo is really taking my body to town, the stem cell graft will hold and flourish happily in my beat down body. Day -6: Me and my octopus arm. Day -6. I get admitted to the hospital tomorrow to begin the second stint of this ironman triathlon I call my treatment. I’m super excited to get this ball rolling so I can start moving towards being fully healthy again. Me and my octopus arm (my Hickman line, which I’ve had for 8 months now and is still annoying) are ready! After a pre-admit appointment in the morning, I’ll go through the tedious process of being admitted and getting situated back on 11 Long at UCSF. Then in the evening I begin day one of a four day bout of chemo, followed by a single dose of total body irradiation on day -1, and then peripheral blood stem cell transplantation on day 0. Excited actually doesn’t quite capture how I’m feeling. I’m a mix of ecstatic, prepared, and hopeful with a good twist of anxious and nervous. It’s a similar feeling to the day before the first day of school, when you’re rearing to go but also hesitant. But I’m ready, I’m here, let’s do this. Over the past few days I’ve been getting things in my apartment in order and making sure that things are set up for when my mom gets here upon my discharge from the hospital. I’ve also packed up a good chunk of my life to take with me to the hospital. After all, I will be there for a month, so a brother’s gotta figure out things to do! Aside from the regular stuff like toiletries, electronics, and comfy socks, I’ve made sure to pack up craft supplies, puzzles, and Halloween goodies! No keyboard this time because it was pretty bulky and I ended up not playing it as much as I would have liked. Since Halloween will happen while I’m admitted, I’m bringing candy and supplies to make goody bags for the other patients on the floor. (I hope no one’s allergic to chocolate or peanut butter…). I’ll be hand crafting each bag and filling them with candy to distribute on Halloween; sort of like reverse Trick or Treating because the candy’s coming to you. I’m excited. Butter and jamon & gruyere croissants. A true labor of love. It took 3 days to make these flaky, delicious puppies. I turned the spare croissants into croissant bread pudding the next day (no photos were taken; it didn’t last long). Mixed berry and fig tart. The last of the summer berries in a tart with pastry cream and a pate sablee crust. Six layered chocolate peanut butter cake. This puppy was made for a dear friend of mine’s birthday. 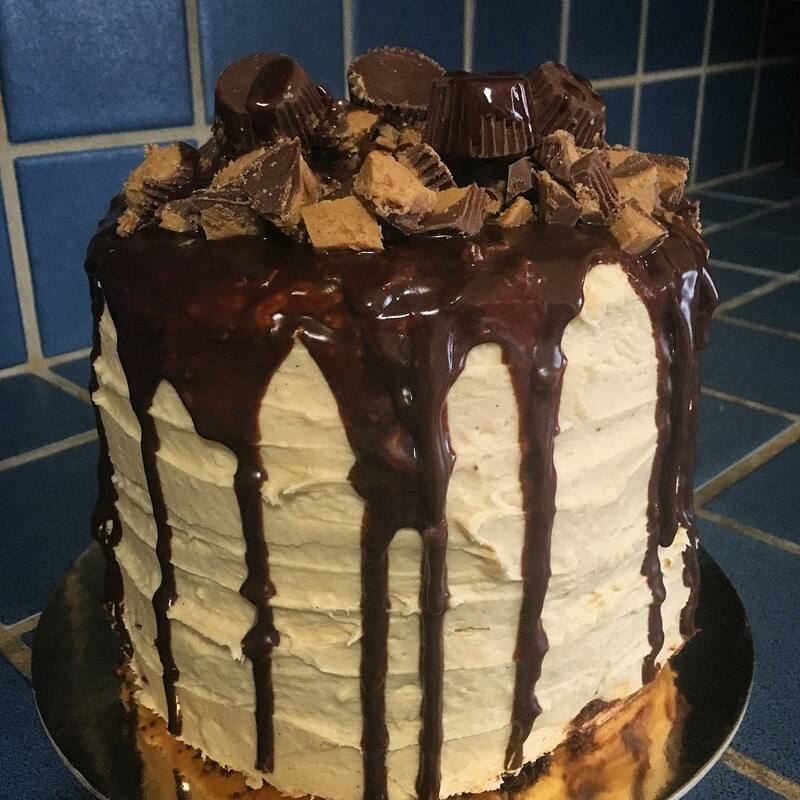 Six alternating layers of chocolate cake, peanut butter, and peanut butter cream cheese frosting; iced with said frosting, topped with a dark chocolate ganache and Reese’s mini cup bits. I used an entire jar of peanut butter for it. It was a big as my head and so delicious! With my last day of “freedom,” I’m doing laundry, visiting some of my favorite places in SF one last time, and finalizing all my packing. Round 2, here we go! Day -16: And the waves keep rolling in. Day -16. Wait a minute. Wasn’t last week day -16? Yeah, it was, but not anymore. When confirming the official date with my donor, they requested to move the date back another week. So here we are, at day -16. Again. Patience is a virtue. A virtue that I’ve not enjoyed acquiring that much, but it sure helps keep me sane. Yes, it is possible to eat too much pastry. I never thought I’d ever utter those words, but it’s true. Your time on this earth is the best blessing you have been given, for free. Use it to the best of your ability. Savor life’s simple pleasures. A warm summer breeze; calm, cooling rain; the ability to breathe and walk; happiness and laughter; the list goes on. These are the things that, when stitched together, make us human. Nothing feels as renewing as getting red blood cells when you’re severely anemic. Day -16: Resetting the Countdown. Day -16. It’s a little bittersweet jumping back my day count to a negative number. On one hand, we have a confirmed donor, a set day for transplant, and a plan to mobilize my continued journey to being healthy again. On the other hand, it’s a reminder that I have to go through this whole process all over again; that all of the physical progress I’ve made thus far gets reset with no guarantee that I’ll be “back to normal” when all is said and done. I’m hopeful that the graft will keep this time, but the Skeptical Biostatistician voice in the back of mind, the same one that helped rationalize scientifically why I’m even going through this in the first place, keeps reminding me of how slim the chances are of this working, based on published data regarding success rates for second allogeneic peripheral blood stem cell (PBSC) transplants in patients with severe aplastic anemia. Either way, I’m clutching, desperately holding onto the belief that positive thinking, happy thoughts, and lots of emotional processing via crying will help keep me alive. Oh, and science. Everything is set for the second transplant. I’ve done all of the necessary pre-requisite tests to prove to my insurance company that I’m fit for transplant (pulmonary function test, chest x-ray, a ton of blood work, an echo, another bone marrow biopsy), as well as other things to prep for radiation (CT scan, getting tattoos on my chest and back to mark a homing center for radiation — my first tattoo!). Now we wait. I get admitted on October 16th and we’ll do four days of chemo. On Day -1, we’ll do a total body irradiation (TBI) of 2 Grays. This amount is very, very little and runs little to no risk of affecting my body negatively. To provide a comparison for how little the dose is: when they irradiate someone with breast cancer, they use 80 Grays targeting the tumor(s) in the mammary glands. For someone with prostate cancer, they use 60 Grays targeting the tumor(s) in the prostate. For someone with a blood cancer like leukemia or multiple myeloma, they use 11-13.5 Grays targeting the whole body. My dosage, 2 Grays, is used merely as an immunosuppressant, and with a dose that low there are little to no complications/side effects. Then, we transplant the stem cells on Day 0, October 21st, (my second re-birthday so I guess my third birthday?) and then we wait and see. I’ve been dealing with a lot of emotions and logistical things over the past few weeks. Lots of hard feelings like anger, frustration, anxiety, restlessness, sadness, and irritation. And some easy feelings like relief, happiness, ambivalence, and contentment. I suppose there’s nothing special about the insane emotional roller coaster I’ve been on, except everything feels super amplified since I’m low on blood. I can’t wait for my second transplant.